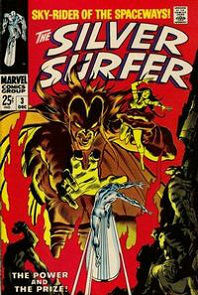 I strongly considered making a new category for the years 1968 to 1971 reflecting the fact that Stan Lee is still Editor-in-Chief but we are no longer in the Silver Age, but there's a lot of debate around where the Silver Age ends and it seemed like i was over-complicating things doing it that way. Still, this is no longer the creative explosion of the early to mid 60s that we are seeing here. Stan is basically one writer among several and while the story telling is still as solid as it ever was (not necessarily a compliment), it is no longer groundbreaking. 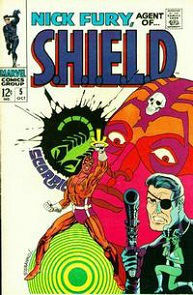 It may have not been possible to continue to break new ground without going into the purely artistic realm (see Steranko's SHIELD run from this year for an example of that) which could have seriously limited commercial potential. Still, it would have been nice to see the writing actually improve now that Stan was not handling the writing of all books by himself and it was understood that the target audience was actually college age kids and not little children. Just as they have been all along, the stories are heavy on exposition, overly melodramatic, lacking in common sense, and full of characters with little to no characterization. Roy Thomas embodies the worst of these traits; even though this is the direction Stan Lee originated, Stan's stories actually seem more intelligent than Roy's - not what i was expecting. Nonetheless, the stories are entertaining, if a bit mindless, and still offer at least minor historical interest since we are still relatively early in Marvel's lifespan. Marvel is riding high in popularity this year amongst fandom, winning top awards from the Society for Comic Art Research and Preservation in every category except "Juvenile humor". Captain Marvel is one of the first new books we've seen in a while. It starts off with an interesting, off-kilter premise but doesn't really deliver. The Silver Surfer gets his own book as well. Additionally, Marvel finally managed to get out of a limitation imposed by its distributor (Independent News, which was owned by DC) that prevented it from shipping more than eight titles a month, so this year sees an expansion of the line as the split-books (Tales of Suspense, Strange Tales, and Tales to Astonish) are broken out into full-length features for each character (Iron Man, Captain America, Nick Fury, Doctor Strange, Hulk, and the Sub-Mariner). There's a huge battle against Mangog in Thor which really feels epic and important until it peters out with a deus ex machina resolution. Continuing stories are a norm, and we see more extended plots that don't get resolved for several issues as well. There's an unofficial cross-over, or just some really tight continuity, that features a de-powered Thor, the Hulk going on a rampage through Asgard, and Dr. Doom instigating a fight between Thor, Daredevil, Spider-Man, and the Fantastic Four. The various plots aren't even related but care is taken to show how they all fit together. There's also a crossover where the Avengers and the X-Men deal with Magneto, Quicksilver, and the Scarlet Witch. Generally speaking, the Marvel Universe is fully meshed together. The concept of individual heroes having their own private rogue galleries is softened, with the Rhino and the Mandarin encountering the Hulk, Magneto fighting the Avengers, Captain America going up against the Trapster, etc. Martin Goodman sold Marvel to Curtis Circulation this year, with Goodman remaining on as Publisher, and a position of Editorial Director for his son Chip. Creator notes: John Buscema handles pencils on Avengers all year, which is a real highlight, even if he isn't coupled with Tom Palmer on inks yet. John Romita only does breakdowns on Spider-Man, which is a disappointment. The Serpent Crown (first the Power Helmet) appears for the first time. 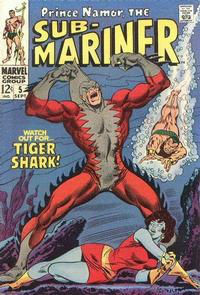 At this time it is merely a long running but ultimately throwaway plot in Sub-Mariner, but the significance of the artifact will increase as it is re-used in later stories. We meet the first Badoon, a second tier alien race in the Marvel Universe. Fantastic Four annual #6 1st Annihilus. 1st Franklin Richards. Captain America #110 1st Madame Hydra/Viper. Rick Jones becomes Bucky.